So, you've bought that new iPhone 5 or iPad mini and now you're wondering what accessory it might go well with? Perhaps a speaker dock would be the perfect addition to your desk, bedroom, or living room! However, if you demand having a Lightning connector available on a speaker dock so that your iPhone or iPad would charge while playing music, then it gets a bit complicated. That's because not a whole lot of the currently available products would suit your needs. In fact, we can fit all of the Lightning connector speaker docks in a single slideshow and have room left for a few models that aren't out yet. Check them out below and don't hesitate to let us know which one you like the most! First we have a compact, yet premium offering by JBL, compatible with the iPhone 5. The 360-gram OnBeat Micro can run on 4 AAA batteries whenever AC power isn't available, so you're free to take it with you on the next Sunday afternoon picnic. The accessory doesn't come cheap, however - it is currently priced at almost $100 on the manufacturer's web page. Need something with a bit more power? Then here's the JBL OnBeat Venue providing up to 30 watts of output power. At the same time, it is compact enough to fit on your desk. The OnBeat Venue by JBL can be yours for $200 and is compatible with both the iPhone 5 and the newest iPad models. Another premium speaker dock from a maker you've surely heard of is the BOSE SoundDock Series III, compatible with all of Apple's Lightning connector devices. Sure, at $250, the accessory isn't cheap, but it promises to provide high-fidelity sound without taking too much space. Plus, you get a handy remote control out of the box. 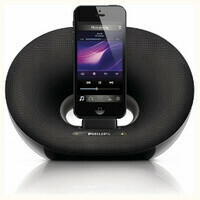 If you're looking to spend no more than $130, keep an eye out for the Philips Room to Room iPhone 5 speaker dock. Despite its relatively small footprint, it should offer decent audio output through the use of quality speakers with balanced frequency response. Besides, it looks kind of fancy, too. $130 is also about as much as you'd spend on a Portable Docking Speaker by Philips. As the name suggests, the accessory is meant to be carried around, which explains the presence of a built-in rechargeable battery. The most expensive iPhone 5 speaker dock by Philips so far is the Lifestyle Music System, which in addition to a Lightning connector also includes a CD player and an FM radio. Its power output is rated at a total of 20 watts. Yup! It is another iPhone 5 dock by Philips. This one is meant to go in your bedroom, which is why it is designed as an alarm clock. The accessory emits audio in 360 degrees and should be well capable of filling a room with sound. This is the iLuv Aud 5 speaker dock for the iPhone 5 and other Lightning connector equipped gadgets. See those white glowing things on top? Those are touch-sensitive controls. Fancy! The accessory was just announced during CES, but unfortunately, it won't be on the market earlier than May of this year. Another iPhone 5 speaker dock that got shown off at CES is the JBL OnBeat Rumble. Like the maker's other offerings, it isn't cheap. It costs almost $400, to be more specific, but in return you get a product that should impress with its performance. The OnBeat Rumble is equipped with a pair of 11-watt full-range drivers and a 4.5-inch subwoofer for enhanced bass response. And last but not least is the redesigned Sound Step by Soundfreaq, which the company announced last month and then brought over to CES 2013. Unfortunately, its speaker docks with Lightning connectors aren't expected to be available before Spring. I have a Galaxy S3 and a Nexus 10, but one(and only) thing I've always been jealous of iOS users is the amount of accessories the iPhone and iPad have. I know for a fact you can connect eiter device to 99% of the recievers available. If you really want to be locked into apples proprietary bullsh*t though more power to ya I guess. As a GS3 owner, i feel the same way. I also have a GS3. I just don't get this whole accessory craze. You do not need to "dock" your phone to a speaker when an aux cord works just fine. "Need" has absolutely nothing do with any of this stuff. You don't "need" your GS3, I guess that makes you stupid for buying it? When you grow up and work for a living you will figure out a lot of people DO need their phone and how "stupid" your comment is. You are correct about the auxiliary jack. However, most people enjoy the functionality of the dock device e.g. if you dock your iPhone to say, Bose portable speaker and your using the grill; you are able to change tracks, playlist, mute etc with the provided remote, or you can purchase a 10' cord. Is the afforded convenience it provides. Tip for everyone considering buying one of these: Just buy a bluetooth connector/adapter ($5-$50 amazon) that will fit into the old docks Result: you now have a wireless bluetooth speaker that will stream all music wireless and will work with any Bluetooth device. that mean andriod,window,etc I realize there is not much speaker choices for andriod and the ones offer is really expensive. I happen to have a old docking station for ipod (which I no longer even own, sold it) and with a Bluetooth adapter my nexus 4 can play music from anywhere in the house. What I learn: New model does not mean better sound the older monster beatbox / bose has better sound/bass than these new models. GS3 owner, i feel the same way. Best option for me was to use the dock from The Lightning Dock to charge my iPhone and use a bluetooth dongle to stream to my speakers, works like a charm.